Spencer and I both saw The Ghost Writer this weekend. In discussing the movie, he pointed out something about a curious reoccurring scene: a gardener attempting to sweep up leaves from a beachside deck during a windstorm that keeps blowing more leaves into the area. A superficial viewing would lead one to believe that the scene is just comedic relief — and indeed a few people in the audience chuckled the last time we see the gardener, who eventually throws up hands in frustration with the impossible task. 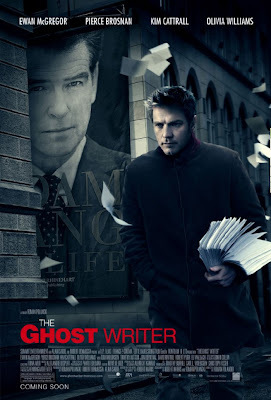 However, Ghost Writer is a Roman Polanksi film. And it doesn’t seem unlikely that a detail-oriented director like Polanski would stick a scene in just for giggles. Spencer didn’t think so, anyway. Via text: “So the man who was sweeping the patio is kind of a Sisyphus, yes?” I agreed. Spencer then noted that in a later scene, Ewan McGregor’s character stands in front of a security system, the brand name of which is depicted in easy-to-read lettering as “Cyclops.” Since Polanski seemed to deliberately pointing out these elements — showing the Sisyphean gardener more than once, making the “Cyclops” brand name hard to miss — Spencer wondered if the film had additional allusions to Greek mythology. I thought about it a bit, and then it hit me: The argument could easily be made that Ghost Writer uses a series of allusions to Greek mythology to underscore the tragedy and pointlessness of the War on Terror by likening it to the Trojan War. It doesn’t fit perfectly, but it wouldn’t be as fun if it did. So here’s a quick little analysis. Spoilers, of course. And please, go see the film if you haven’t. Hit the jump if you have — or if you enjoy being spoiled, you naughty rascal you. Recall, if you will, the cause of the Trojan War: Helen of Troy. She’s famed as the most beautiful woman in the world, yet she’s just one person. Depending on your opinion of female beauty, she’s probably not worth a decade of war, countless lost lives and the annihilation of the city of Ilium, which I’ve heard had lovely parks. In short, the Trojan War was a war for nothing. Map the events of the Iliad onto contemporary politics and the parallels between them and the War or Terror are obvious. Like the Spartans sailing off in pursuit of a pretty woman, various international forces (but mostly Americans) invaded Iraq in search of weapons of mass destruction that, in the end, didn’t exist. (Kind of like how Helen probably wasn’t the epitome of beauty she’s now reputed to have been.) Neat, huh? I’m sure the comparison has been used before, but given how nicely it works, I’m surprised the analogy hasn’t been used more often. Ghost Writer is all about the War on Terror — or at least a very thinly veiled version of the one happening in real life. The film centers on Tony Blair stand-in Adam Lang (Pierce Brosnan), disgraced former British prime minister, who is facing trail for war crimes for his role in delivering suspected terrorists to the CIA. In the midst of this, a writer (McGregor, whose character’s name is never revealed) is ghosting Lang’s memoirs into a book. In doing so, he stays with Lang, Lang’s wife, and various staffers in a Martha’s Vineyard mansion where Lang is temporarily hiding to escape the unmitigated hatred of the British people. By staying with the Langs, McGregor’s character gets to know them well, learns various secrets about their marriage and rise to political power and ultimately ends up investigating the mysterious death of his predecessor. Though McGregor’s character initially suspects that the former prime minister was a plant by the United States government to guide Britain to act in the Americans’ favor, he eventually learns that the real CIA operative is Ruth (Olivia Williams) — Lang’s wife and the real political mind in the family. (Shades of The Manchurian Candidate and, of course, Macbeth.) So let’s consider this in the context of the Trojan War analogy: Just as the U.S. managed to rope Britain into participating in the War on Terror, so too did Menelaus (Helen’s legal husband) convince his brother Agamemnon to join in the Trojan War. Other than a brotherly bond, Agamemnon had no real motivation to join a war. I mean, why would anyone? In fact, the only reason that Menelaus got the support that he did is that Helen’s wise father, Tyndareus, made all of Helen’s suitors — among them, Menelaus, Agamemnon, Odysseus, Ajax and Patroclus — make a pact that they would honor and defend whoever should win Helen’s hand. In Ghost Writer, Lang resigned from office, essentially sending the Agamemnon figure in the story back home to his wife. If you remember the story of Agamemnon, the homecoming was a bad one, as his wife, Clytemnestra, axed him to death as he climbed into a bath. Her reasoning? Probably about three-fourths that Agamemnon sacrificed the couple’s oldest daughter, Iphigenia, in an effort to get good winds on the way to battle and one-fourth that he returned from the Trojan War with a concubine, Cassandra (the one nobody believed), who had given birth to not only one baby but twins. (My take: One baby would have been bad enough, but twins is just too insulting to bear.) A major departure that Ghost Writer takes from the Trojan War is that Ruth doesn’t directly kill Lang. Instead, Lang is assassinated by a British man — a former solider fuming that his solider son was killed in the war Lang chose to join. So Ruth killed Lang indirectly, given that she was pulling his strings and the entry into the war ultimately caused Lang’s murder. However, the person who physically pulled the trigger on Lang is a man who is angry about the death of his son, who has been sacrificed to aid a pointless war. And doesn’t that sound a bit like Clytemnestra? It’s a bit odd to consider, but it really does seem that Ghost Writer script has essentially mapped Clytemnestra onto two different characters. What, then should we make of Kim Catrall’s character, Amelia Bly, the sexpot aide to the prime minister? According to a Daily Mail article on the Robert Harris novel from which Ghost Writer was adapted, she’s a re-creation of real life Blair aide Anji Hunter. For the purposes of this analysis, she’s also a Cassandra figure, not because people don’t believe what she says but because she’s having an affair with the Agamemnon character. The connection between these two is probably the most tenuous, especially considering that many don’t see Agamemnon’s relationship with Cassandra as a significant motivation for Clytemnestra to kill him. It would be great, then, if I could make one more connection between the Ghost Writer characters and those involved in the Trojan War. The obvious candidate would be McGregor’s character, since he’s so central to the story. And when you consider that he’s the one who outsmarts the politicos and gets to heart of the various conspiracies and shady dealings that went down in the Lang administration, it seems he could likely be Odysseus, renowned for his cunning. McGregor’s character is also British, but travels to Martha’s Vineyard to work on the Lang book. As soon as life in the Lang household proves to be tumultuous, he seems to want out and long for home in London, where he eventually goes at the conclusion of the film. I feel safe making a parallel between McGregor’s character being trapped in the U.S. and Odysseus’s inability to return home to Ithaca for the ten years of the Trojan War and the following ten years of the Odyssey. And the fact that McGregor’s character never gets a name would seem to be a wink at Odysseus alias in the Odyssey, “Nobody.” Remember that when Odysseus blinds Polyphemus the cyclops, he identifies himself as “nobody” or “no man,” depending on the translation. And doesn’t that seem like an appropriate reference point for a nameless character whose role is to slip invisibly into Lang’s life and invisibly write up his memoirs? In the end, the Sisyphus gardener and the Cyclops-brand security system are just tip-offs that something larger is happening beneath the surface of the film. Ghost Writer benefited, of course, from Polanski’s expert direction. But I feel enjoy it more for having these references, as they deepened the meaning of the film for me and helped me see connections between age-old stories and things happening today. I like the stories of Greek mythology. I like it when we’re reminded of why these stories are relevant. And I like it especially when they help to tell yet another great story. A special thanks should go out to Zachary Mason’s novel The Lost Books of the Odyssey, which I just finished and which helped put the characters of the Iliad and the Odyssey on my mind. If you made it this far in this post, I encourage you to pick it up. It’s a joy for anyone who has ever loved the stories of the Trojan War and thereabouts and would like to see them brought to life once more. Read more: ghost writer, helen of troy, movies, mythology, roman polanski, that war thing we have going on, things british, things greek, tony blair, trojan war, what do you do with a BA in english? Interesting reading of the film, thanks. I took the gardener as a reference to another gardener in the Polanski oeuvre, the one in Chinatown. I don't think the gardener in GW is, but it's telling the help in the movie is mostly Chinese--poor McGregor's character, who is never named, has wandered into his own lawless Chinatown without knowing it. And, the odds are good his predecessor "drowned" in that very tub he takes a soak in before Ruth seduces him--it would be a perfect inversion of what happens in Chinatown, when Mulwray is found with saltwater in his lungs even though he's fished out of a reservoir. Speaking of Macbeth, Polanski directed a brilliant and brutal version of it. Well worth seeing. And another neat twist--Fritz Lang, who shares a surname with the film's former prime minister, was a German director exiled to American during WW II. Polanski, because he's in exile, shot the American exteriors in Germany. Good insight on your part too, especially with the drowning business. I got a lot more to chew on with Ghost Writer than I initially realized.